was just the beginning. I felt called to return every year, to make a 60-mile trek in to this sacred place, called Mt. Belukha. I did this also, and each year, I received a profound initiatory experience. Since 1999, I have spent half my time in Russia. That has culminated in the opening and releasing on August 13, 2011 of a huge cache of life force that had been sequestered in the mountains of Altai by the Brotherhood of Light for Mother Earth in time of need. When the energy came through me, I became one with the energy of the place and have no further need to physically go there, although I will continue my work with the Altai people. One of the initiatory experiences in Altai involved José and Lloydine Argüelles in 2001. Spirit brought us together in a most humorously serendipitous way at the Russian Consulate in Seattle, as we were both going for our visas. Spirit brought us together again in Altai, and that was where I met my Moscow "family," who have collected themselves into an organization called the "Light Center." That group had organized the Arguelles' visit to Altai. Alex was the first member of this group whom I met. Even then, his English was so good that I thought he was American. The trips into Altai were difficult for me, because I did not speak Russian. So for several years, I made long stopovers in Moscow. In 2004, I camped on his and Victoria's kitchen floor for a month while we made spiritual mischief together. Altai was as sacred to Alex as it was for me. I have had many, many wonderful times with members of the "Light Center," but especially with Alex and his wife Victoria, and with the couple, Raduga (Rainbow) and Vadim who were the inspiration for the center and were mentors for Alex and Victoria. Raduga passed over just a few months ago, and has prepared the way for Alex, so he will be able to orient himself quickly and get to work on the other side. Through another series of serendipities, I connected Alex up with Drunvalo Melchizedek's Spirit of Ma'at editor Susan Barber, because they needed a reliable translator of the zine into Russian. Eventually, Alex became their webmaster, which he has been for several years. He will be missed by that organization. who was Susan Barber who recognized that they were dragons. I was amazed to discover that the she herself was one of the black dragons, and that she knew who the other two black dragons were. One of the black dragons was aware that when we incarnate, we always divide out into male and female — in my case, I was the female, and Alex was the male. So we are not even twin souls—we are the same being. In 2006, Alex and Victoria collaborated with the organization of an international Altai expedition that I had been guided to do. Most of my photos of him are from that time. It was an utterly magical trip. We are all still very, very close. My granddaughter Kylie, then age 11, was part of the group. Alex and Kylie became the closest of buddies, and Victoria was a surrogate mom. Subsequently, Alex and Victoria were a main conduit for American spiritual thought in Russia, providing translation services and logistical support for more spiritual teachers than I can name—among them, Drunvalo, the Argüelleses, James Twyman, J. J. Hurtak, Tom Kenyon, and Gregg Braden. Even as his health was fading, he organized and led pilgrimages for the Light Center group to India, Greece, and the American Southwest. 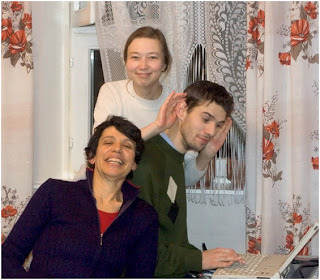 The last time I physically saw Alex was in Moscow in December 2009, when he organized one of my “Painting Light” play-shops for the Light Center group. The first that I heard he was sick was last March, when he skyped me from his hospital bed. At the time, he thought he had a kidney infection. But soon thereafter, he told me about the diagnosis of amyloidosis. I understood then that he would pass over soon, but never did I suspect that it would be this soon. So what did/does Alex mean to me? Simply, with Alex around, everything is okay, gracefully handled, and in total alignment with Spirit. His hug was pure bliss, as countless people know. And that he can serve the Creative Force more powerfully without a body… And that everything is in perfection… Even so, his parting has stretched me, despite the unmistakable little infusions of love he has been sending to comfort me. Fly high, Alex! Thank you for blessing us with your presence! Carol Hiltner is a Seattle-based author/artist/activist facilitating global survival of and access to traditional wisdom! Carol divides her time between Seattle and Siberia and focuses her efforts on sustaining the sacred land and people of Altai in Siberia, through Altai Mir University, www.AltaiMir.org, a nonprofit organization that she founded. Carol is a professional editor and founder of Altai Books (www.AltaiBooks.com). She is also a prolific visionary artist and author of several books, including two Altai Chronicles: Tablets of Light and Out of Time, as well as many articles for Spirit of Ma'at. Visit Alex' site on the internet, there you find a lot more pictures and the links to Carol's albums, too.